Data Realms – Dev Log » Blog Archive » Steam Trading Cards come to Cortex Command! 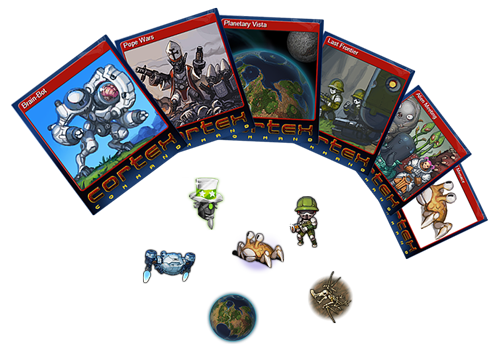 Steam Trading Cards come to Cortex Command! Hi! My name is Jake ‘The Heartsman’ Harold, I’ve recently joined the Data Realms dev team, and I’m here to tell you about the first job I did: Steam Trading Cards! 6 cards to collect, 6 badges, 10 emoticons and a bunch of Steam profile backgrounds, meaning you can now show off just how much you love Cortex Command to all your friends (and probably enemies). This is the start of a lot more Steam integration for our games; there’s a lot of exciting stuff ahead of us! I can’t explain how excited I am that CC is starting to get updated again! Oh man, I really look forward to this. I sure hope there is a crab emoticon because I love that crab. LOL is the pope robot guy even in the game?